These are my (Erik Paulson) notes from the 200 E Mifflin Steering Committee meeting of November 23rd 2009. The guests were Bill Knobeloch, director of the City of Madison Parking Utility, and Tim Parks of the Planning Department. There were 16 committee members present, along with Alder Maniaci. This post should be considered “draft” status for the time being. There are likely transcription errors, so please don’t quote anyone from this post without confirming with them first. The meeting started off with Bill Knoebloch. Bill talked about how there are two different tracks of for these proposed developments, particularly the development on top of the parking ramp. The two tracks proceed somewhat independently, and the hope is that they’ll both meet up at the end. Bill talked about the parking side, and not the land use/development side. The McCormick Ramp, or Capitol Square North ramp, was built in 1971, and built to high standards for the time. Per Bill: “Built it to robust standards, with vertical expansion capability”. It can currently hold 631 cars, and could add 3 or 4 more floors. Foundations and columns are built to withstand the extra load. It can handle some combination of more dynamic load (ie, adding more cars, or other things that move around) and static load (ie new apartments, things that won’t move around). Garage was built to the lateral load standards of 1971. (ie wind) Modern standards might need lateral load to be increased. Of the 631 stalls, 150 are prox-cards controlled, that is, more long-term parkers with an electronic pass. 431 stalls are hourly. McCormick/CSN average occupancy of the hourly stalls is 68%, as measured at “Peak” times, which are 10am-2pm. That makes it middle occupancy. Lowest is 52% at Overture, Government East is the top, 85%. Don’t like to get above that 85%, full light goes on at 90%. Occupancy of McCormick, including monthly, is 79% at peak. Brayton Lot (the big lot at Butler and E Washington) is 98% at peak. Cap Square North has longest stay – 43% park at least 5 hours. This is the highest level of long-term parking in any of the city ramps. Bill tries to project demand out for 10 years (after that, just not accurate). Try to anticipate shifts in demand, like possible ULI redevelopment on the square, and children’s museum move. Doesn’t really see demand increasing much in the next 10 year. Children’s museum will have 50-60 their own spots. Demand is high enough that city wouldn’t sign long-term leases for some of the spots in the McCormick ramp for any development, without new parking. The ramp is built with post-tension concrete floors. That means that in order to go too high, you’d have to go through the floor to add more columns, but to go through the floors requires that you completely rebuild the floors. You can’t drill a hole through any of the floors without replacing some of the very expensive post-tension cable system. If there’s new parking above the existing ramp, it would be “Nested” parking – use the same card through the two gates. If they don’t get to their own gate within a few minutes, they’d pay the city for parking in the city’s stalls. Engineering study – Bill just saw the Apex consultant’s version not too long ago, but the city does its own report every year anyway, so they didn’t learn anything new. Currently they jackhammer out rusting steel and recover it with concrete. Last year, had $93,000 in maintenance. Bill doesn’t want to speculate on the lifetime of the ramp. Would prefer to have a professional engineer, with the insurance to back the PE up, to make that claim. The current stairwells are not to code for having people live above the ramp. The stairwells aren’t load-bearing, so replacing them would be easier. A new development would add elevators, and the parking utility would be open to sharing the cost of the elevators if they can share the use of the elevators, but hasn’t asked Apex about it. Every building that has people living above it must have a fire suppression system. Every parking ramp has had a fire in at some point. Apex (or any developer) would have to sprinkle the ramp as-is. Also may need to consider HVAC upgrades, to handle potential fumes from the ramp below. About one developer a year comes to ask questions about this ramp, at least in Bill’s tenure. Bill speculates that most are scared off by the cost. But, as a city, we may want to have something there. Bill doesn’t see there being demand in the next 10 years to justify adding more parking. Air rights: has experience, have already sold the air rights once to the CDA. The Parking Utility would want to do things before selling them, and then the Transit Commission could recommend selling them, with the Common Council approving. First step: declare airrights surplus. Second step: At developer’s expense, get a serious, specific, structural engineering study of the final design. Third step: City would use its own engineer/consultants to review the design. Jeff Sims: When was the last time Apex got in touch with you? Bill: Three times. First was in July, with the previous big tower design that wasn’t structurally possible. Apex came back with some questions, last time was probably a few weeks ago. All visits informal. Jeff: Once a year contacts on opportunities at ramp, can you elaborate? Bill: Sometimes inquiries are just a phone call. Apex is the first that he’s seen that got as far as doing a structural analysis, and first that looked at lateral load. Bill: First, chartered parking utility, take no money from taxpayers, raise it all from fees. Have to sell assets at fair market value. Last time they sold the air rights was $600,000. Would get an assessment, they’d get an assessment, and go from there. The parking utility would demand money in cash, no interest in a land swap. Marilyn Martin: concerned about precedence on building above the three corners of the square. Doesn’t want to bury the Capitol. Bill: Most other ramps aren’t built enough to go higher. Govt East isn’t an option right now right now. Only Cap Square North/McCormick and Overture Ramp have vertical expansion capability. Margaret Fountain: How many more floors could CSN/McCormick ramp take? Bill: in the 1971 thinking, they put the additional expansion capability because they thought the demand for parking would grow faster than it did. Ruth Shelly: If the building was constructed on top of the ramp, would the ramp have to close during construction? Bill: If they necessitate closure, the utility would charge them for whatever spaces are not available, so it’s in Apex’s interest to minimize closure. Last year, that ramp did $774,000 in revenue, so if the closed the entire thing, that’s the scale they’re talking. Bill: There’s been interest in the past to “rent out” an entire building during an event (like an MSO concert), but the Parking Utility hasn’t been keen on this idea. Jason Tish: Do you require the structural analysis of everyone? Bill: Wouldn’t tell anyone anything about the capability of the building, would recommend they get their own engineer. Gary Tipler: Are you already planning to replace the stairwells? Bill: Yes, sort-of. Already have contracts with a company to replace the doors and windows. But not doing that for Apex, had already started that process long before Apex approached them. Gary: Elevators, any Apex interest? Bill: Hasn’t asked them yet, but expected that they would be. No current plan to build an elevator. Overture Ramp has a cutout in the post-tension floors if they ever wanted to add another elevator. Chris Atkinson: When would Govt East be redone? Bill: Govt East built in 1958, to much different standards. Consultants have said on govt east there’s 1.2 million worth of work that needs to be done. New ramp would be underground, from back of Madison Municipal Building to the wall of Great Dane, cutting underground of Pinckney. Huge footprint, saves lots of space because they don’t need to turn corners nearly as often. Alder Bridget Maniaci: Govt East could happen within 2 years. Marcus Corp has first refusal. That expires in two years. Needs to overlap new ramp with govt east, so it will be constructed in phases. (ie build new ramp, open new ramp, tear down Govt East, build rest of new ramp.) Phasing should limit demand increases elsewhere. Tim Parks: He’s a Planner with the City, charged with reviewing new developments. Currently, the Apex proposal is very abstract. Apex is at 40k feet design, would not get into specifics until they get down to 5000 feet. Tim is on the land-use track. This is a very interesting site, as a transition point between square and low density residential. In the downtown core area of the forthcoming downtown plan, but very close to the JMPD, which may wind up being the existing character and lower density in potential recommendations. The plan has to deal with the fact that the ramp is there, and doesn’t look like other things in JMPD. Marilyn: There is a great deal of demand of parking in the downtown. Capitol Point residents can watch the lines waiting to get in, will only get worse with children’s museum. She has a second comment – with current “green” thinking, wouldn’t it be lovely to have a roof garden that could double as parks? Tim: Park space in the downtown is, and has historically been, lacking. On the exteriors of the downtown only, like Brittingham and James Madison Park. Otherwise, really only Lisa Link. Adding more land is very expensive, especially if we had to assemble park piece by piece. To build above the parking ramp, there’d be additional engineering effort, especially if we had to go for urban cultivation. In order to just put a green roof on the McCormick, we’d still have to sprinkle the lower levels/put in ADA upgrades, even if no one lived there. Jeff: In the downtown plan, is the JMPD is going to call for higher density? Tim: No, likely will have west of Webster will go higher, east will be lower density. The McCormick ramp is an exception, will be sort of a sawtooth. Bridget: sense is that the occupancy in JMPD will remain roughly the same, though occasionally projects will increase or decrease on small area. Tim: JMPD might be poised to take on the character of Basset, where small infill redevelopment. Doesn’t think things like Bedford court, where 12 buildings were demolished, but smaller things. Carol: How long ago was Butler plaza? Is it in character with the neighborhood now? Tim: 1997? Would preface it by saying he started in 2004. E Wash is a different animal, even though the plan starts at Blair. Butler Plaza is an example of an attempt to bring the density of the square towards the rest of the corridor. Tim: Even more at 38K foot view. Will have a number of significant steps to have it happen, lots of questions about the building mass, and the obvious question of the Lamp House. Landmarks will be involved. Carol: Can we landmark the parking ramp? Kenton Peters designed it. Anne Stoelting: Where/when does Traffic Engineering get involved? Bill: When they know for sure what the use will be, with the number of units and the number of stalls, then TE will get involved with what happens on the street. But we’re way early for that discussion. Bridget: Apex is looking at something out in D19, (Mark Clear’s district, west side of town) Maybe something in D6, too (Marsha Rummel’s district, Marquette/Atwood). Bridget is asking other council members what they may be shopping around. Bill Gates: So, Apex has done something with an engineering study, where do we think they’re at? Bill: This was sort of a prelim study, probably better for doing it before they brought anything forward, just due diligence. Bridget: they’re at sufficiently high level that Apex is at least a year out. Tim: Depends on which side of the street, a few months away before City Planning Staff starts reviewing. Focus primarily in ramp, but will flip to other side of the street. Currently, ramp is zoned C2, General Commercial activity. In fact, all of the 100 block of N Webster and N butler is zoned C2. It would be perhaps a bit of a surprise to the 1966 zoners that the houses are still there. F.loor A.rea R.atio is 3, ie land area times F.A.R. is how many square feet you can build. But that doesn’t include parking, so ramp wouldn’t count, conceivable that you could do so without requiring a rezoning. (Erik’s note: is residential permitted in C2?) Even if they don’t rezone, they’d almost certainly have to get a conditional use. Would have to notify alder and Neighborhood association 30 days before filing. Because it’s a public building, would go to UDC, too. (Erik’s note: I have in my notes, “South side of the street, almost certainly would require a rezoning”, which seems inconsistent with what I just wrote) Across the street, would need landmarks, a demolition permit, which would require a 60 day notice before filing of “interested parties” in addition to alder and NA, because it involves pre-1940 buildings. Tim: It’s important that committee is meeting right now, when/if something does happen, would like neighborhood to be able to speak on whatever consensus we can come up. If there’s something we can find that we can tell city decision-making bodies the minimum of what passes the “smell test”, that would be helpful. Hopes an outcome of tonight’s meeting is a sense of what is possible. Neighbors need to know what the city is thinking, what the developers are thinking, what the rest of the neighbors are thinking. Carol: doesn’t have a good sense what JMPD is thinking. Steering Committee hasn’t seen their draft plan. Jim Steakley: The short version, 2-pager is coming soon. Doesn’t directly address the Apex proposals. This committee might be a good place to have both JMPD and Mansion Hill have a say. If he had to summarize where we’re coming to, there are number of hurdles for the Lamp House, and a desire to see something on the ramp. Tim: Well, maybe “fewer hurdles” on the ramp. For example, more shade on the Butler if we build the ramp. However, anything in comparison to building next to a FLW house would have less scrutiny. Marilyn: Why JMPD has initiated this process, why can’t we work together to build something that enhances the entire city? Erik Paulson: This committee is in response to a couple of proposals that Apex brought forward, not a solicitation. Carol: If the neighborhood document emphasizes the importance of preserving the E Mifflin side, what does that say on the parking ramp? Carol: When we say “The City” we mean the taxpayers. What does that mean for the parking utility? Bill: Parking utility paid for the land, built the structure, issues its own bonds. But, would imagine that the city would step in if the parking utility defaulted. Gary Tipler: How about Transfer of Development Rights? We’ve mentioned it as a potential application on the Mifflin block. Tim: Parking utility isn’t interested in land swap, difficulty in valuing the development rights. 12 people would come to 12 different answers. Lamp House complicates value of development rights. Will check with Brad Murphy to followup with Urban TDR. Chris: Quick fact checks – 79% occupancy? Bill: Monthly parking with hourly is what you’d use. Chris: If they were 85% and not 79%, would you consider it surplus? Bill: No, because they’re building more parking. 79% is only at peak 10am-2pm weekdays. Ruth Shelly, from Children’s Mueseum: 9-5 operating, 10-5 peak. 50 spots, open parking at city ramps, don’t provide staff with parking. Doesn’t know how many people will use the parking – a heavy day is 500 people/day, expect that they won’t meet demand with the on-site ramp. Will be 24/hr meters, may use some of it as a fundraiser (ie, during Concerts on the Square). Will be “Pay Per Space”. Really value having on-site parking. Thanks for coming tonight. Their building is also designed for extra load on top of the existing building, elected to use the top of the their building as a greenspace instead of the extra 4 stories they could put there. Bill Gates: Could we invite JMPD come next time to talk about their draft plan? We’ve been sort of going around in circles and would benefit from getting the neighbor perspective. Gary: Would like to have more info about TDR. This steering committee could be a leader in applying TDR in Madison. At that point, we’d reached about 9pm, and we adjourned for the night. Our next meeting is December 7th, 2009. On Monday, November 9th at 6pm, the Steering Committee will be hosting Jack Holzhueter. Holzhueter has many years of service with the Wisconsin Historical Society, as editor of the Wisconsin Magazine of History, and serves on the board of the Frank Lloyd Wright Building Conservancy. The purpose of this meeting will be to learn more about the history of the Lamp House and surrounding block. Steering Committee meetings are always open to everyone, but we’d like to especially invite community members to attend this meeting. You don’t need to have an interest in any of the development proposals for the block. If you’d just like to learn a bit more about a part of the neighborhood you might not have even known was there, it’ll be well worth your time. Wisconsin magazine of history: Volume 72, number 2, winter, 1988-1989. Frank Lloyd Wright’s Designs for Robert Lamp, by John O. Holzhueter, pp. 82-125. To make it easier to print, I’ve assembled it into a one-file PDF version. Click here to read it. The meeting is at the First United Methodist Church in Fellowship Hall on the first floor. We hope to see you at Monday night at 6pm! On October 12th, 2009, the 200 E Mifflin Steering Committee met to discuss and react to the previous two meetings and presentations from Apex regarding development ideas. There were just about a baker’s dozen neighbors present. This meeting took place without representatives from Apex. Our discussion focused mostly on visioning and process. 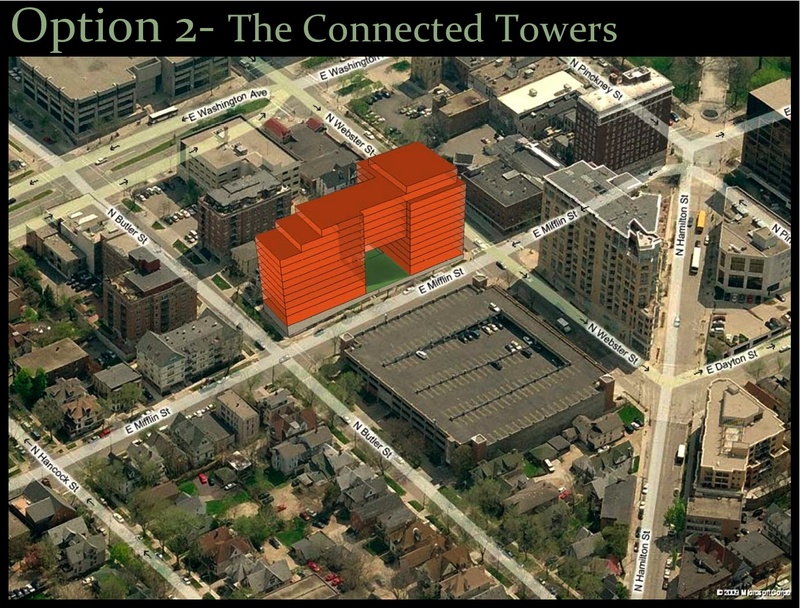 The significant new information we learned at this meeting was how far discussions had progressed with the city regarding “air rights” to the parking ramp. (We’ve been using “air rights” as a generic term to describe the right to build on top of the parking ramp.) The update (via a Capitol Point neighbor) came from Bill Knobeloch director of the Madison Parking Utility. No one from Apex has approached him regarding developments on the ramp, though Alder Maniaci gave Knobeloch a heads up early in the process. There is history for this sort of transfer – in 1996 the city sold the rights to the Madison CDA (Community Development Authority) to build on top of the ramp. The CDA never moved forward with the project, and eventually the city repurchased the rights. (And by “purchased”, we mean bought and sold for $1, so it’s not an accurate valuation of the rights). The Parking Utility could not identify a standing policy of how exactly these rights would be sold again in the future. Additionally, the parking utility will require additional engineering studies before they were satisfied that any development could occur above the ramp. Although our discussion was wide-ranging, there were three themes that dominated the discussion. The first was the condition and future of the existing homes on the south side of Mifflin, including the Lamp House. There certainly was interest in seeing the Lamp House enhanced and preserved. We are interested in getting a detailed condition report on the existing houses, as well as exploring other options for those houses. We also know that Kitty Rankin, the recently retired Preservation Planner for the city, had files with more information on these homes and we’re going to track that information down. The second theme revolved around neighborhood planning, and city processes. In particular, we committed ourselves to producing something tangible from this process to inform future developments, even if in the end Apex doesn’t move forward with either proposal. We discussed neighborhood plans, conversation districts, the downtown plan, and the comprehensive plan, and their relations to one another. We resolved to bring someone in from the planning department to speak to us specifically about the approval process that these projects will need to go through. Finally, and closely related to the second theme, we discussed the wants and dreams of the neighborhood. That discussion will feed into other meetings, and I won’t try and list them all here. In the end, after the neighborhood has said what we want, we left ourselves open to the possibility that the developers will decide that they’re not the right developers for this spot. For the next meeting, we agreed to focus primarily on preparing for a follow-up meeting with Apex. We have agreed to put together a package of feedback, comments, and questions that we have regarding the proposals we have seen thus far. For questions, we have decided that we will look for both new questions, along with questions that have been previously raised but that we don’t yet feel we have full answers for, with the caveat that some questions may just not yet have answers. We’ll get those to Apex, and hopefully have a meeting with Apex in early November. On September 29th, the steering committee and interested community members met with representatives from Apex to continue the discussion about the future of the 200 Block of East Mifflin. Below is my attempt to capture the discussion. I have tried to be accurate, but it is not an attempt to be a verbatim transcription. I would confirm the accuracy of anything written here with individual it is attributed to before quoting them. This is a fairly long post, so for those of you who just want the highlights, here are what I think is the significant new pieces of information we learned on the 29th. None of these are obviously set in stone, so a year from now don’t go saying “Apex said this in September of 2009, why are you saying this now?”, especially since I could have written it down wrong. The number of units has been cut back, to about 120 instead of 140. Apex does not yet have a signed agreement for all of the properties necessary for options 1,2, or 3 (the options not on the ramp), but the agreement is written and understood in principle. Apex tossed out some initial target targets for what a condo would cost, if they were selling it as condos: 125K for a 600 sq ft 1Bedroom, 200K for a 2 bedroom. The meeting started 30 minutes before Apex arrived, with the committee members introducing themselves and going over some ground rules. When Apex arrived, we asked them to start out with a review of their proposal concepts, using the same material as the September 21st meeting. The remainder of the meeting was an open discussion for about an hour and 15 minutes. The first 15 minutes were dedicated to “simple” questions that could be answered quickly, and were aimed at clarifying the proposals. Brenda Konkel: Parking in options 1-3 – is it all below the floorplan? Answer: Yes. Followups – How many stories down of parking? Answer: 3. Anything exposed? Answer: Hopefully not, except the entrance. Martha Hausmann: All of the drawings seem to have the same number of floors (options 1-3). Parking ramp is different. Why are they all the same? Clarification: one option has different floors on different parts of the buildings. Parking ramp option – 7 floors from the street. Bill Gates: Does Apex have options on the other properties (for options 1-3)? Answer: yes, Apex does. Have had previous discussions over the past five years. Is it a done deal? It remains to be seen what is going to be built. An agreement is written, but not signed, so getting fairly far along. Follow-up from Bill Gates: Who may be interested in financing this? Answer: Hard to say, things are very different than a year ago. Apex believes that things will turn around. Gary Tipler – For the parking ramp option, the floorplan is currently an H-shape. How much flexibility is there in the floor plan to try different things like setbacks and interior lighting? Answer: Somewhat constrained by having to put the stairwells and elevators at the corner. The ramp floors are post-tension concrete and can’t be drilled through, which means verticals have to be outside of existing floorplan. The existing stairwells have to go because they don’t meet current codes. Followup: How much room for setbacks? Answer: Maybe 15 or 20 feet. Followup: Why an H shape? Answer: Just design, but doesn’t have to be to be. Followup: Could you move the stairwells? Answer: Egress [exiting the building] regulations don’t give you much flexibility. Carol Toussaint: How does this work, processwise? Can the proposal move forward without the neighborhood process being done? Erik Paulson: Steering committee will continue to meet with Apex, ask questions, give concerns, wishes, and other feedback. Apex does not yet have enough done to start a formal proposal with the city. Steering Committee will steadily work on project, but won’t be rushed. If Apex goes to the city and steering committee isn’t done, Steering Committee will go to Alders and City Commissions (UDC/Plan/Landmarks/etc) and explain what they’re doing and ask for more time. So long as the steering committee isn’t dawdling or otherwise dragging its feet, city will almost certainly delay hearing the proposals. 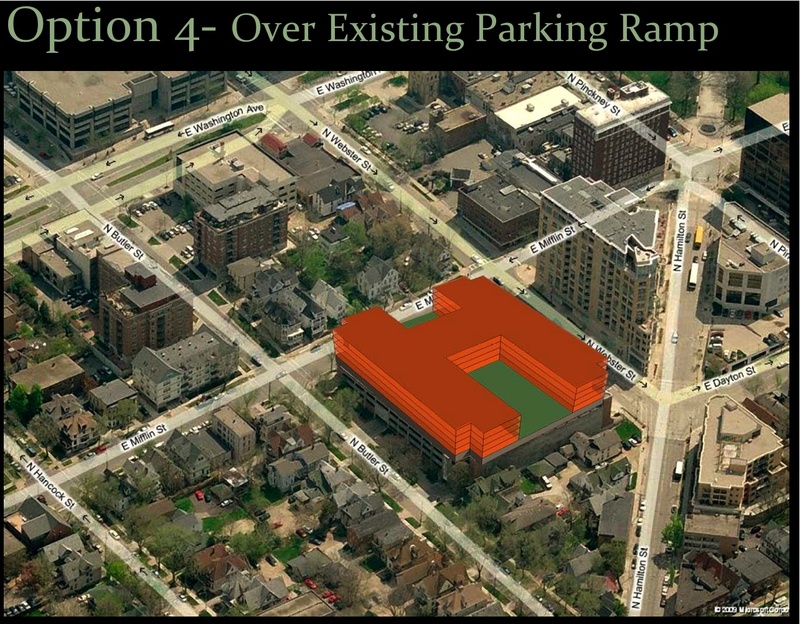 Ilse Hecht: If option 4 [building on top of the parking ramp] were chosen, what would happen to the other houses on Mifflin? Bruce Bosben: We don’t know. A question for the neighborhood, would it make sense to restore those houses such that no one would try and redevelop them anytime soon? The question is if the community thinks the row of houses is worth preserving at the expense of other options for the block, then so be it. But, here’s Bruce’s opinion from studying with James Graaskamp – Downtown development has the most potential for paying for other parts of the city through increase of property taxes. Bruce’s claim: 1% of city land, in the downtown, pays 14% of property taxes. Preservation is noble, but comes with a real cost. Current buildings generate $90k in taxes. A $50 million building could generate a million dollars a year in property taxes. Steve Yoder, followup answer: Some discussion of transfer of development rights. To walk away from the development potential of that block, will the city recognize the value there? Could it be tied to the air rights? Bruce follow-up answer: Is it right for those of us today to decide for the development options for that block for future generations? Paul Norman: Please explain the historical significance of this block. Gary Tipler: referred to article from Wisconsin History, RE: the relationship between Frank Lloyd Wright and Robert Lamp. FLW built a family cottage for Lamp on Lake Mendota, then designed the Lamp House for Lamp. Lamp worked on the Square, and was a paraplegic and so needed to be close by. Afterwards, Lamp started to buy the rest of the block. Moved a house over 10 feet to create the current driveway. The idea for the space: privacy for the house and greenspace. The house has hidden entrance like most FLW houses. It also has many windows and an open living layout. 3rd floor used to be views of the lake and the family cottage. Jason Tish, Exec Director of Madison Trust for Historic Preservation, adds: The Lamp House is still in very much in its original context – on much of the block, the buildings are original, though none of them individually are necessarily historic. What does the potential downtown plan have to say about these blocks? Will get information about that for the blog. Gary: [Drat, missed part of his beginning, will try and fill in] The house was an early experiment in his prairie style, one of the few remaining FLW buildings in the area. Nationally, FLW groups are interested in Madison. This is an opportunity to enhance the Lamp House as an asset to Madison and increase its value to the city. Perhaps first use of transfer of development rights in the city on this block. Brenda: The Downtown preservation plan only looked at commercial buildings in historic districts, and didn’t look at every house in downtown. It looked a few randomly around downtown. On that block, only looked at the Dance studio house [223 E Mifflin]. Gary: There is the potential for a national historic district on this block. Paul Moriarty: Are these apartments or condos? 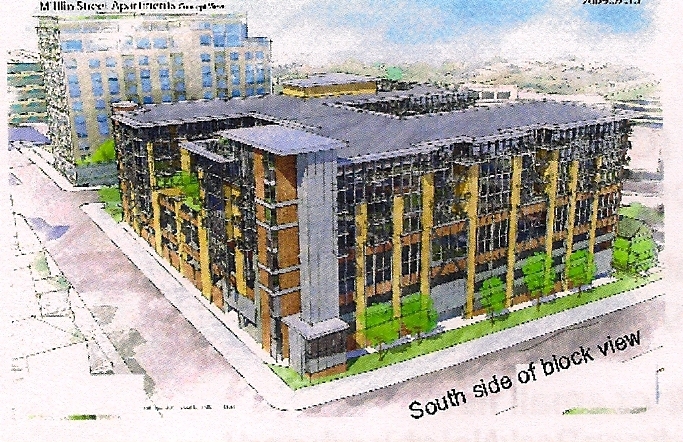 Bruce: would prefer to initially offer them as condos, but until market stabilizes, going to have to be apartments. But, built to condo standards. Could sell some as condos right away. Followup: In buildings with high percentage units are rentals, it can be difficult to get financing for a condo. Bruce: Believes that is true mostly in existing buildings. Paul Norman: McCormick ramp was originally designed for extra floors, yes? Has the city decided that we don’t need public parking? They did decide that in 1996, but would now we would have to restart that process. Paul Soglin: On council at the time it was built, original idea was to put four ramps around the Square at the corners. It was never imagined that it have extra parking added, always hoped it would be housing. Economically can’t build parking ramps for maximum their maximum utilization anymore. This ramp is lowest utilization in the downtown, especially after Alliant pulled out. Parking ramps never make money. Paul Lorenz: Has Apex or Iconica ever had projects this big? Iconica, yes, this would be a new one for Apex. Iconica: resort projects in the Dells and Chicago, commercial buildings in Madison. Bill Gates: Apex threw out a number, $50 million – is that a reasonable number? Bruce Bosben: Maybe. Steve Yoder: waiting to decide more about the design and concept of the project before budgeting, so not really sure. Bill: How much time in between projects? [Note: not options 1/2/3 and option 4 projects, but time between hotel project and this project] Bruce Bosben: a year or two. Bill Gates: Views are worth a lot, as James Graaskamp taught us. Options 1,2,3 impact view of Lake Monona. The height here seems only to come from one corner, ignores the other corners. Why not try to acquire the rest of the block and try a different building? Steve Yoder: Chicken and Egg problem: can’t give budget numbers until the design is more hammered out, but people want to know budgets early. Bruce Bosben: Apex has 9 developable sites in Madison, started to propose ideas 8 or 9 years ago. Made the mistake of coming forward with designs, thinking that’s how it made sense. Therefore, resolved that not going to do anything other than come up with a shape and paint a design on it to make it clear it’s a building. Come with minimal design and see what consensus the group comes up with. Jeff Sims: What other development sites are you considering? Bruce Bosben: Hotel on Wilson, Yaraha River site, a site straddling Gilman and Gorham to refurbish old mansions and fill in a vacant lot. Also, 600 Block of East Johnson, the ugly red brick building. The two most prominent sites are the Mifflin site and Wilson St. Not vacant land, but underutilized. Paul Soglin: Takes different view, more than just tax dollars. Referred to black infant mortality in Madison, which has declined to be even less than white infant mortality. Corresponding to that decline is a decline in premature infants. If you take over the last five years the infants that we had expected to be born have been premature but weren’t, who would have been hospitalized for the first two months of their lives but didn’t need to be, it saved $7.2 million. That does not take into account subsequent extra costs that preemies incur as older children. Probably the reason for the decline: south Madison health center, which provided increase in access to social services. 2 months ago, WSJ suggested that city cut back on social services. If you look at Madison budget, we spend more on our social services than other cities. The reason we can support that is a growing tax base. Single family home developments: most costly from a tax perspective, consumes most basic services (snowplowing, fire stations, etc) per unit. The denser developments proportionally capture more taxes per service. Bruce Bosben: underground parking is only financially supported by development in the central business district, growing taller. Bert Stitt: this could be the impetus for the James Madison Park District to get serious about a neighborhood plan. Lack of a plan makes the district vulnerable. At the September 21st meeting, after the Apex presentation, the meeting turned to comments and questions from the audience. We captured these a brief synopsis of each comment on large easel pads of paper at the front of the room, which are categorized and listed below. Lamp House designed to be in the middle of the block. Lamp House: would you restore the house or leave it as is? Lamp House as nationally important destination / vision . Scale: Why not scale down? Why so many apartments in the area. Much retail has failed. Step down to E Mifflin from E. Washington . Parking ramp is hideous. May block some views but capital pt did too. Property values of neighbors in Capitol Point – Lake view eliminated in option 4 – it is a leviathan. Does Apex own the whole block? Do you own 314 E. Mifflin? Drunk construction workers. Are you in negotiation with other owners? Whole block play? Pipe dream: Walkway over Webster, park on top of parking ramp – engage children in the neighborhood. Bus route, especially when on outer ring. Have you talked to T.E. ? Are you looking for TIF funding? This post will cover the first part of the public meeting of September 21st, 2009. In another post, which we’ll get up in a day or two, we’ll recap the comments and questions from the audience. 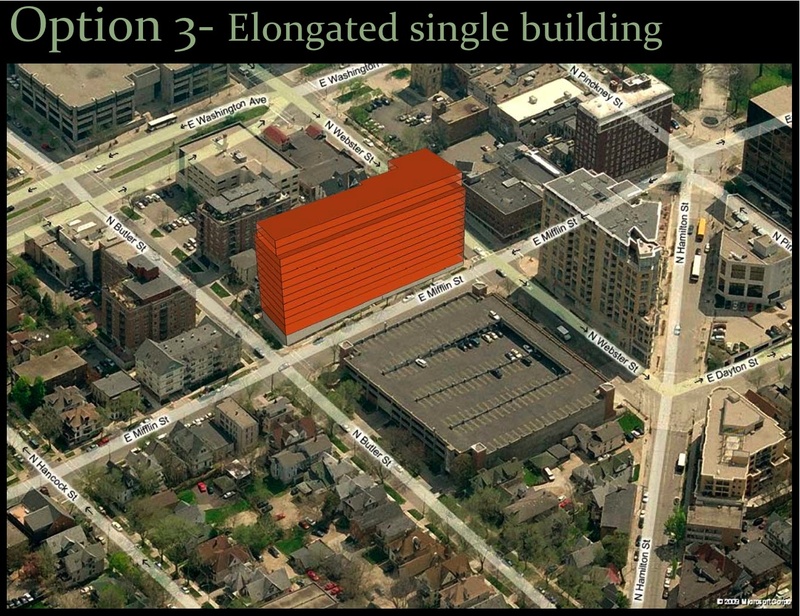 At the September 21st public meeting, after quick introductions from Alder Maniaci and the steering committee, Apex presented their concepts for the 200 block of East Mifflin. The first presenter was Steve Yoder, president of Apex. His presentation, available here in PDF format focused on Apex the company, some of their other properties, their motivation for the project, and an introduction to four concepts: three on the south side of the 200 block of E Mifflin, where existing two and three stories homes are located, and one on the north side of E Mifflin, on top of the McCormick parking lot. The second presentation was from Matt Tills and Bob Feller from Iconica, focused more on the four designs. Their presentation is also available here in PDF format. I’ve pulled out the massing designs of the the concepts, because I think those are the easiest versions to get oriented and get a sense of the building concept. The full presentation includes some styled renderings, as well as top-down views of the building footprints, so please check that out, too. 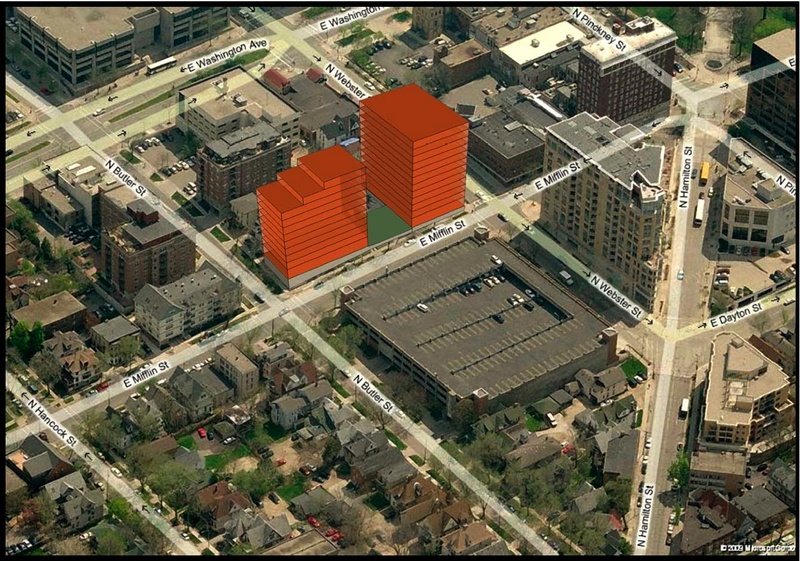 Using SketchUp, Apex attempted to show how the parking ramp concept aligned with the Capitol Point condo tower. It didn’t quite work, so Apex sent this rendering to the steering committee two days later. They did not present this on the 21st (so don’t think you’ve gone crazy and missed it at the presentation). This blog will be updated over the next few months with information on any development proposals that come forward for the 200 block of East Mifflin. We’ll be covering information from the developers, neighborhood meetings, and formal city approval meetings. Apex is presenting two concepts at the public meeting on September 21st. It’s important to remember that these are both very early concepts, and Apex is not proposing these as final designs. Both of these were taken from a flyer that went out to neighbors in the James Madison Park neighborhood. Apex will have much bigger versions at the public meeting on Monday night. We're just getting started, so there's nothing here yet!